Foot Patrol: When it comes to her efforts to protect Canada’s Great Lakes, Josephine Mandamin walks the walk—literally. In the spring of 2012, Josephine Mandamin, an Anishinabe elder originally from the Wikwemikong Unceded Reservation on Manitoulin Island in northern Ontario, will receive her bachelor of arts from Sault Ste. Marie’s Algoma University. But when it comes to water conservation and the role that aboriginal women can play in those efforts, she’s long been the one doing the teaching. 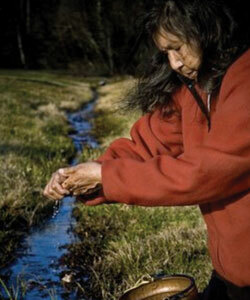 Since 2003, Mandamin has led the annual Women’s Water Walk, which began with the circumnavigation of Lake Superior. Walks around Lakes Michigan, Huron, Ontario, and Erie have followed in the years since. Mandamin is planning another walk for 2012 that will circumnavigate Lake Nipigon, a smaller lake that drains into the Nipigon River before feeding into Lake Superior.